Camping know how is a must have. I have always said if you're going to buy an RV, you need to use it; otherwise it is nothing more than a large and expensive lawn ornament. 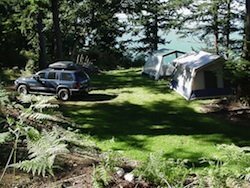 The more you know about campgrounds and RV Parks, the better your camping experience will be. To gain camping know how, you need to determine how you plan to use your RV, explore all of your options or join a club or clubs that is just right for you. How do you find these campgrounds, parks and resorts? Should you make reservations before leaving on a trip? How do you register when you arrive? What kind of site should you request? Do you need a partial hook up or a full hook up? What RV terminology do I need to understand? What kind of camping etiquette should you be aware of? You don't have to belong to any kind of camping club to go camping. If you have never been camping before, let me suggest you go to the one nearest to you and get a day pass. The pass will last all day and you can see what's involved and observe what others do. Take note of any special gear you might need. Drive around and look at how others have their site set up. Don't be afraid to stop and talk to other campers. They are there because they love camping. They will be glad to talk to you about their camper and their experiences. Besides, you may walk away with a new friend that is willing to help you when you do bring your camper. One of the greatest ways to keep up with your information is just a plain notebook for keeping notes. You can find books at your local Bookstore for RVers. It will take you through the pre-buying inspection process, the pre-delivery inspection, and then what to do and look out for when setting up and breaking camp. You will want to read everything you can about RV campers, travel trailers, the use and care of them and campgrounds. You can start with a journal book. You can also buy a book that allows you to keep up with information of which gives you the secrets of first-time and family camping. Some you can download right to your computer and start your exciting journey to the campgrounds that interest you. Browsing through our site will inspire you to learn camping tips, camping know how, and advice to help beginners get started and prepared for their camping trip. The best advice you can get is from someone that has been there, done that. When you first get your travel trailer or RV, you need to study the guides that come with it to get familiar with everything. It's like a new house with lots of things to figure out. Learning to pack your RV is an important thing to know when preparing your first trip. You can visit our RV Camping Checklist page for information on what to bring for a successful camp out. For tent campers, there is a shorter version. One of the most helpful books you can buy is camping directory. It is a travelers guide and will provide much needed information, for example, Interstate Rest Area Guides, RVer's Guide to Dump Stations, and the most used map is in the Walmart Directory. Visit our camping tips for newbies page if you're still gathering information. We want you to be as comfortable as possible when you are finally ready to head out! Don't forget: You will need insurance on your travel trailer. You can get different quotes from insurance companies or you can go to the place where you know carries the best insurance for your RV. Get a free mechanical breakdown insurance quote from Good Sam CSP. The Good Sam Club is known nationwide for their outstanding service. Check them out today and get your camper insurance with the confidence. You can find great books on camping know how or just browse through our site pages and you will find tons of pages loaded with helpful hints and tips. That's why we built the site! Please enjoy!